Mike Fraysse Sports, LLC, one of the nation's leading cycling coaching, training and travel organizations and leader of the United States Cycling Federation's (USCF) Team USA group headed to compete at the Pan American Masters Cycling Championships, in Havana, Cuba, announced this week that it has received official license for travel to Cuba from the U.S. Treasury Department for its all-inclusive, Sept. 17 - 26 trip. "We worked so hard for this approval and it finally came through. It's really the once-in-a-lifetime opportunity for any cyclist and their fans," said Mike Fraysse this week. Fraysse and his well-travelled, destination cycling staff have dialed in all the details to provide for an exciting, pro-feel, well supported, safe trip. The road and track competition for men and women, ages 35 and older, will feature the finest masters-level cyclists from North, Central and South America and the Caribbean. Fraysse Sports' trip includes a travel visa, round trip airfare from Miami to Havana, all related in-country ground transportation, all-inclusive hotel accommodations, competition entry fees, Team USA masters national team clothing, and medical insurance required by the Cuban government. Fees per person are $2,595.00 per person, double occupancy, with single occupancy available for $200.00 extra. "Due to the short lead time, reservations must be made by August 15," Fraysse noted. "It's virtually impossible to travel to Cuba, and so we've already gotten urgent calls from Team USA cyclists looking to go." 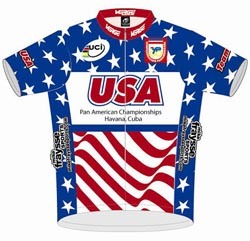 Athletes must have a valid 2010 U.S. A. Cycling International License. For registration and more information, contact Mike Fraysse at (845) 856-3335 or mike@mikefrayssesports.com. Since 1994, Mike Fraysse has operated Mike Fraysse Sports, LLC, based in New York's Catskill Mountains. Clients include not only America's top riders, but also elite athletes from many Latin American and Caribbean nations. In recognition of his efforts to increase global popularity of competitive cycling, the Union Cicliste Internationale (UCI) presented its prestigious Merit Award to Fraysse, one of the only Americans to ever receive such an honor. In addition to his U.S. governance roles, he was also the vice president of the Pan American Cycling Confederation.